Marvelous by its very nature, Real Estate Firm Joomla Template was custom-made for property agencies. Designed by the team of professional developers, it has even more power than you think a perfect template should have. Ready-made pages are a great investment that would help you to save extra bucks on programming. Simple look, with no distractions, will ensure worry-free browsing. 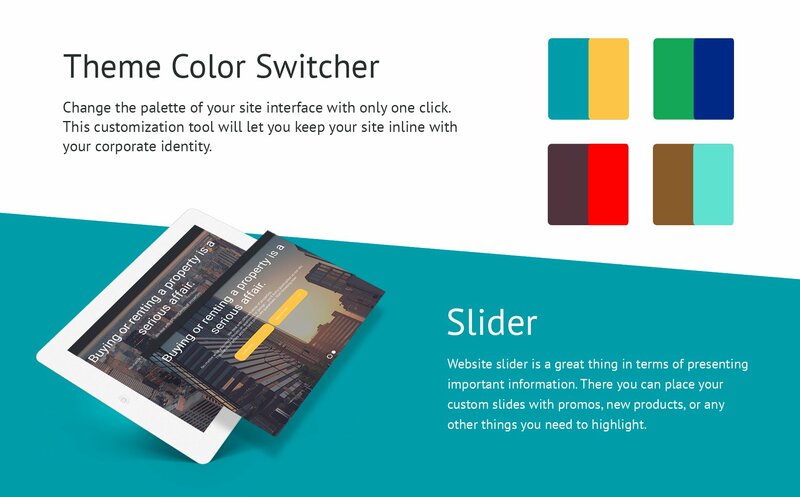 Screen-filling smart slider will capture visitors attention and they would be curious to dig deeper into your site. Traditionally provided with Blog and Gallery, the theme gives you full freedom in telling a compelling story of your brand. Hidden hamburger menu, which can be unfolded on demand, will add on to the overall neat style of your site, a visitor will be able to reach the desired page in an instant. 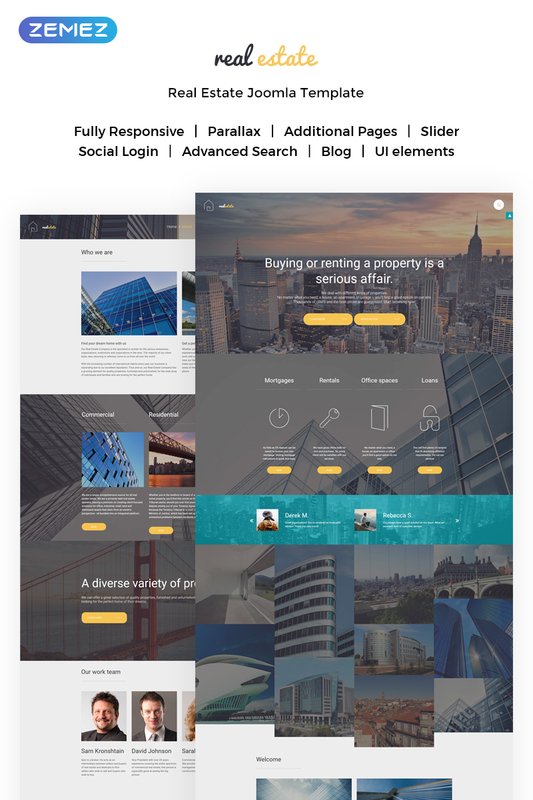 Professional look and lightweight structure this is what Real Estate Firm Joomla Template is about, try it now with the live demo preview. Responsive web design helps to get quality user experience and provide a entire access to the internet site data from any gadget. This is the most popular HTML and CSS based framework containing styles for the most important components used in the HTML coding. Bootstrap is especially adaptable for any modification. It's not hard to work with, has a wonderful grid system and wide elements number. A parallax scrolling effect is a technique in webdesign when background image moves at a slower pace compared to a front content, creating the optical illusion of 2D effect. 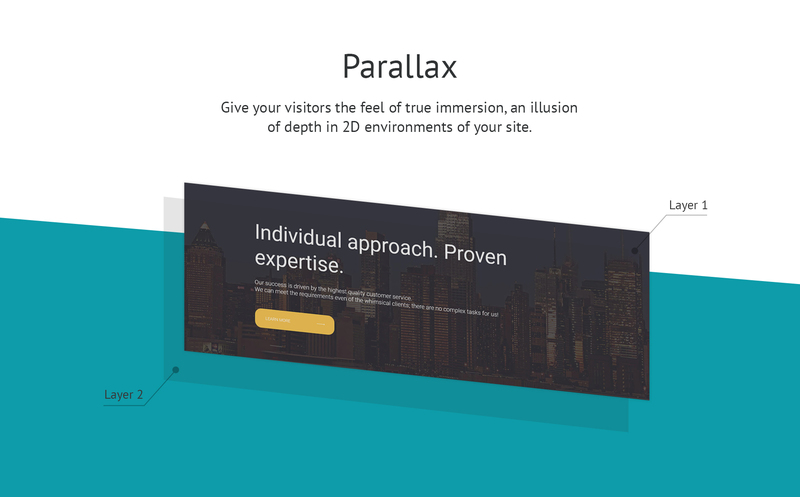 Parallax make it possible for your customers connect with your web page and generate an improved customer experience. It helps you to stand out among your competitors. How can I modify Joomla template for Estates to suit my particular website? Please visit our Online Help Center to obtain detailed instructions on editing Joomla template for Estates. Can I customize the Joomla template for Real Estate Dealer? Yes, you can customize the Joomla template for Real Estate Dealer to any extent needed. You cannot use a header of the template for one project though, and images from the template for the other project. Can I resell the customized Real Estate Joomla design theme? No, you cannot resell the customized Real Estate Joomla design theme as a template but you may sell it as a project to your client (see paragraph 1 ONE TIME USAGE LICENSE for more details). What is the price for acquiring the extended license for Joomla design theme for Real Property? There is no set price for acquiring the extended license. The price is based on the Joomla design theme for Real Property's unique price for those templates you would like to use for the integration. The price for purchasing license for a single template is half of the template unique price. Are there any limitations on selling the Joomla theme for Services as the integral part of my new product? Can I put a line at the bottom ( or any other spot) of the customized Joomla design for Realtors "Website design by Company name"? No, you cannot place a line at the bottom ( or any other spot) of the customized Joomla design for Realtors saying "Website design by Company name". Nevertheless, you can place "Customized by Company name". 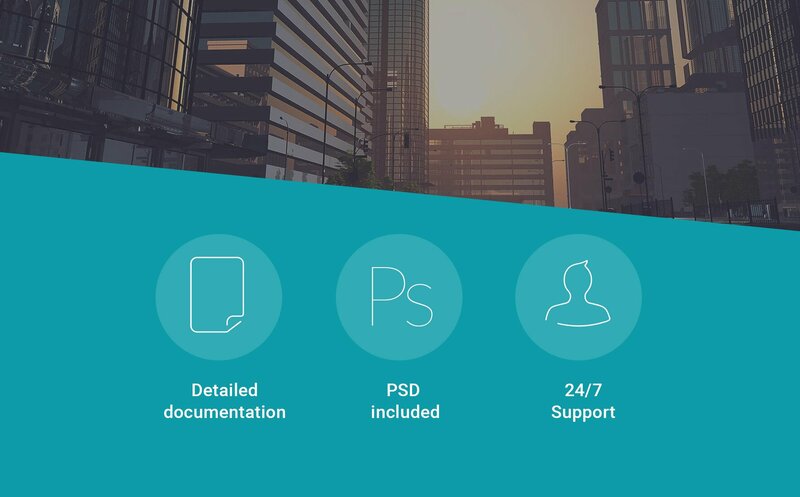 I like the image from the Business Company Joomla design and would like to use it for my advertising campaign, can you send me this image in a higher resolution? No, we can't provide image in higher size or resolution rather than it is on the Business Company Joomla design. We recommend looking for professional images on online photo resources. Is it possible to buy the particular image from the Joomla design for Business Company? No. According to our Terms and Conditions we never sell the images separately from Corporate Joomla design themes (as well as the templates separately from the images). Can I integrate the Joomla design theme for Real Estate Rentals with third-party software or applications for development of my new products? No, you cannot get the developers license for development of Joomla design theme for Real Estate Rentals or other products. I ordered a Joomla design for Business News but haven't received the download information. In case of not receiving the download information of a Joomla design for Business News , please contact our Billing Department via support chat by phone or e-mail. Can I put low resolution thumbnails of Joomla themes for Services on my website for my clients to choose designs? Can I customize the Real Property Joomla theme if that's required by application settings? Yes, you can customize the Real Property Joomla theme code, graphics, fonts to any extent needed. I would like to purchase Joomla template for Real Estate Broker, but it is not available on the site anymore. The Joomla template for Real Estate Broker has been sold out for exclusive price or discontinued.As technology inevitably develops, TemplateMonster may discontinue the production of certain products. It can be no longer available for sale because of being outdated. Is it possible to reactivate my download link for Joomla theme for Business Bureau if it was deactivated after 3 days? Yes. Please re-activate the download link for Joomla theme for Business Bureau within your account under the Downloads tab or contact our billing department directly regarding that. Will you help me to customize my Business Joomla design theme? We do not provide any help or instructions on Business Joomla design theme customization except for www.template-help.com help center. If you are not sure you can customize the template yourself we recommend to hire a design studio to customize the template for you. Is it possible that Template Monster will contact my client which website I made from Template Monster's website Joomla design for Real Estate Company? Yes, our legal department checks licenses regularly. In case we won't find designer's contact information on the site which was made from the Joomla design for Real Estate Company of ours we will contact the owner of the site directly. Can I resell the Joomla design for Real Estate Company as is? No, you cannot resell the Joomla design for Real Estate Company as is. In what cases I don't need the extended license for Joomla templates for Estate Agency? Can I resell Joomla themes for Real Estate Agency I bought the developers license for? You cannot resell the customized Joomla design for Businessman as a template, but you may sell it as a project to your client. What is a unique purchase license for Joomla design for Businessman ? If you purchase the product at a 'Unique price' it guarantees that you are the first and the last person to buy this Joomla design for Businessman from us. It means that this template has not been sold before and you become an owner of a unique design. After this kind of purchase the template is being permanently removed from our sales directory and is never available to other customers again. The unique purchase license allows you to develop the unlimited number of projects based on this template, but the template should be customized differently for every project. Can I get the Joomla design for Real Estate Agency in higher resolution to use for printing? Will TemplateMonster help me to edit my Joomla template for Property Agency? TemplateMonster offers you a variety of sources to help you with your Joomla template for Property Agency. Use our comprehensive Online Help Center to get the basic knowledge about your Joomla template for Property Agency. Our Knowledgebase contains customers questions and most frequent problems. Anyway, you can always use TemplateMonster 24/7 phone support, try our Ticket System or Live Support Chat to get qualified assistance from our support representatives. Requests for a refund are accepted at www.template-help.com/tickets within the period of 2 weeks after the order of Joomla design for Real Estate Company is placed. You should accompany this request with detailed and grounded reasons why you apply for a refund. Please make sure your request does not contradict the terms and conditions specified in the policy. A refund is issued to you upon receipt of a Waiver of Copyright signed by you. Please email to marketing@templatemonster.com with your inquiries about Joomla designs for Real Property. What is Developers License for Joomla design for Realtors? If you purchase a Developer's license, you are granted a non-exclusive permission to use the Joomla design for Realtors on up to 5 domains for projects belonging to either you or your client. What do I receive when I order a Joomla template for Estates from TemplateMonster.com? After you complete the payment via our secure form you will receive the instructions for downloading the Joomla template for Estates. The source files in the download package can vary based on the type of the product you have purchased.If you need unzipping software to open the .zip archive, Windows users may visit www.WinZip.com, Mac users may visit www.StuffIt.com. Site, team and support do excellent job. Site is very comprehensive, explain everything and do everything that I needed. Template is not complicate for use, has everything that we need. Outstanding and fast customer support, even my english is very poor. Highly recommended to anyone. I would have no reservations in recommending Templatemonster and to come back for my other sites. Thank you very much. Great template. Very beautiful and very easy to match your own needs. - Updated Joomla to version 3.8.11.